Try it FREE! - Only pay when you print or e-file. Prepare your own income tax return here. - Get your refund fast! It is absolutely free to enter your data and review the Summary and Diagnostic Pages. You may come and go and review these pages as many times as you want. 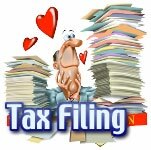 The Summary Page includes Gross Income, Adjusted Gross Income (AGI), Deductions, Personal Exemptions, Taxable Income, Tax, Total Credits, Total Taxes, Total Payments, and Refund or Amount Due. It also includes the State Tax Liability. The Summary Page links to the Diagnostics Page if any problems are encountered with your return. It will provide you with recommended solutions for those problems as well. All of this is absolutely free. In order to view , print and Electronically File the prepared tax return, you will be required to pay a fee of $19.95 federal and state return. This fee is for preparing and for E-Filing your return. You may pay by Visa, Mastercard or American Express through our secure payment system, or you may elect to have your fees deducted from your refund.